Patricia Perez – Master in Landscape Architecture Barcelona – Universitat Politècnica de Catalunya – 35ª EDITION. 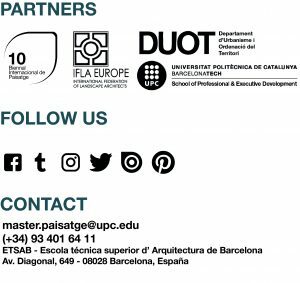 Born in Madrid on February 12th, 1971, graduated in “Landschaftsplanung und Landschaftsgestaltung” (Planning and Landscape Design) at BOKU University Vienna (1995), she zcourses the Master in Landscape Architecture at the ETSAB. UPC (1997). Since 2001 she is head of the Landscape Unit in the Barcelona City Council. She has worked as an assistent teacher at the Master in Landscape Architecture (MAP) and at the Official Master in Landscape (MUP) of the UPC, at the Master d’Architettura del Paesaggio (ACMA Milan), in the postgraduate course of Urban Planning and Mountain Architecture (UPC), at the University of Ferrara and Elisava. She has also worked on different publications, “Analogies. Animal, Mineral and Vegetable Architecture“, Parramón Publishing and “Garden design”. Te Neues Publishing.